I know you’re going to take a lot of pictures on Christmas Day, right? It’s seriously the biggest day for photo snapping! 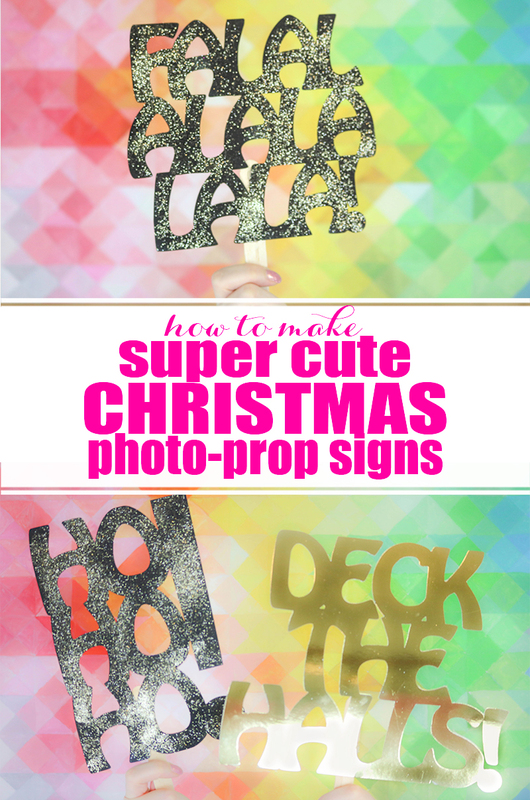 Add some fun and whimsy to your holiday photos with these super cute Christmas Photo Prop signs! They are so quick easy to put together. Honestly, I think they are one my most favorite things I’ve ever made. I just want to make them for every occasion now! NOTE: the pngs have a transparent background, so when it opens in the window, you’ll see what appears to be total black, but if you look closely, you can see the words. All you have to do is right click and choose Save As. It will download and you can print it out and use it as your template, or upload it into your Cricut design space and use it as a cut file. Just watch the video below to see how they are made. 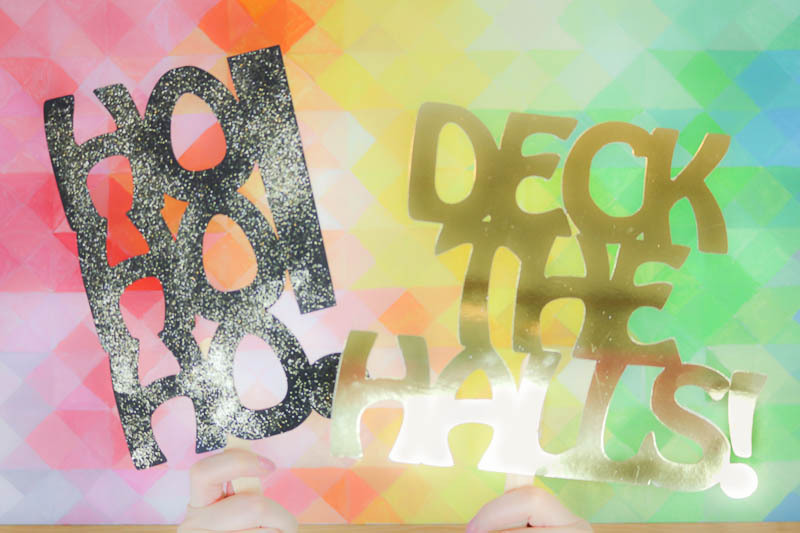 You’ll get a sneak peak of what working in the Cricut Design Space is like! 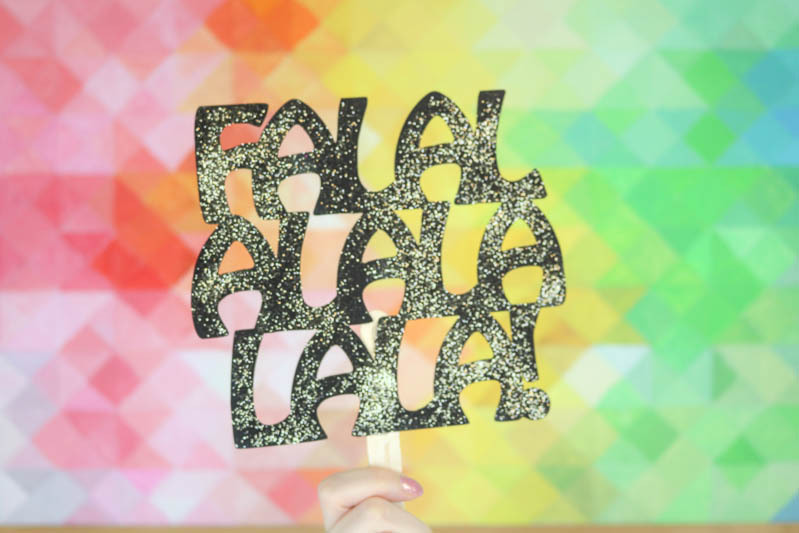 These signs are just the perfect addition to your Christmas fun. And with a Cricut cutting machine, they are super quick and easy to make. For the black signs, I used cardstock and gold glitter with Elmer’s Spray adhesive. It doesn’t take much glitter because you want the black to show through. For the gold sign, I used Gold ScrapBook paper and that’s it! You can use and color or color/glitter combination that you want. All you have to do is cut the words out, decorate as you will and then glue the popsicle sticks to the back. Seriously couldn’t be any easier! If you want to make your own phrases in PicMonkey or Canva, be sure to adjust your letter and line spacing so that all the letters touch in some way. Otherwise, your signs will totally fall apart. That would not be super cute, eh? Oh, and the photo background is just my DIY Pixel Art, so if you are looking for a bigger project for the new year, then there’s one for you. This is probably it for Christmas projects here at the Bold Abode, so I’d like to wish you the happiest of all Christmases! P.S. For all the Christmas fun, just visit my Christmas Gallery!